Speed skater Gunda Niemann won eight Olympic medals including three gold, 19 world titles, eight of them overall crowns, set a string of world records, notched up over 100 World Cup victories and left the sport as a living legend. Amazingly, the German did not come to the sport until she was 17 after dabbling in a whole range of other sports including cycling, swimming, volley-ball, table tennis and athletics. At the 1988 Calgary Olympics, competing as Gunda Kleeman (her maiden name), she finished a respectable seventh place in both the 1500m and 5000m races. Second spot in the all-around at the 1990 world championships was followed by gold a year later, this time for the West German team whom she had joined some months earlier. After moving from Chemnitz club to Erfurt, she met judo expert Detlef Niemann and the couple married. 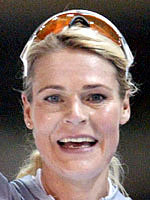 Gunda Niemann, as she is now known, powered home to take gold in the 3000m and 5000m races and silver in the 1500m at the Albertville Games in 1992, racing for the unified German team. Despite her formidable record at the world championships, Niemann flopped badly by her standards at the Lillehammer Olympics in 1994. After finishing third in the 1500m, she was determined to do better in the 3000m, but after just one lap of the track, she caught her skate and tumbled onto the ice, taking hopes of gold with her. Two years later, normal service was restored when she finished ahead of her compatriot Claudia Pechstein in the 3000m race at the world championships in Hamar. At the Nagano Games in 1998 and with a new husband in tow, this time her Swiss manager Oliver Stirneman, she made up for the unfinished business she had left at Lillehammer by easily winning the 3000m. A silver medal behind Holland's Marianne Timmer followed in the 1500m, and just when it looked as though the 5000m gold medal was hers, she was edged out by Pechstein by just four 1/100sec. Since taking time out to have a baby, she has struggled to get back to the top although coming fourth in the 5000m and fifth in the 3000m at the 2004 world championships. In January 2005, she entered a clinic in order to try and solve her back troubles and it would be a problem that forced her into retirement in October the same year. Named the greatest women's speed skater of the last century, her place in sporting history is well assured.